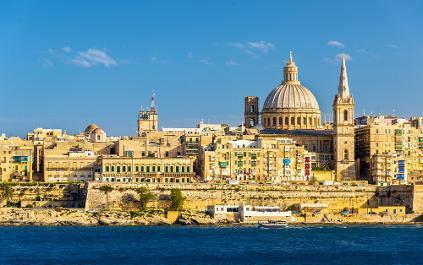 Malta is 60 miles south of Sicily, right in the middle of the Mediterranean. It is made up of three islands: Maltal, Comino and Gozo. It lies on a recently submerged land bridge that connects Africa to Europe. The geology is made up of a succession of mid Tertiary limestones and marls. Day 1. Arrival and transfer from the airport to the hotel in Silema. Day 2. Locality 1: Red Tower on the Marfa Ridge, Upper Coralline Limestone - good view. Locality 2: Descent of Upper Coralline Limestone cliff (steps) Blue clay exposure. Locality 3: Cliff path to view Globerina Limestone and fault, return to car at Mellieha Bay. Locality 4: Ghain Tuffieha Bay, exposure of Greensand at Ta'Lippija - walk to Locality 5: II Karraba, Blue Clay, Greensand and Upper Coralline Limestone. Locality 6: Overview of Gnejna Bay. Day 3. Locality 1: Mqabba - AMV marble works. Locality 2: Local quarry of 'soft stone' Globerina Limestone. Locality 3: Ghar Dalam cave and museum. Locality 4: Marsaxlokk. Locality 5: Valletta. Day 4. Gozo. Locality 1: Xlendi Valley, viewing Xlendi fault in Lower Coralline limestone. Locality 2: Xlendi, walk along harbour to view cliffs to the north of the harbour - Globigerina Limestone. Locality 3: Xlendi solution structure, viewed from locatiy 2. In Lower Coralline Limestone, it is filled with Globigerina Limestone. 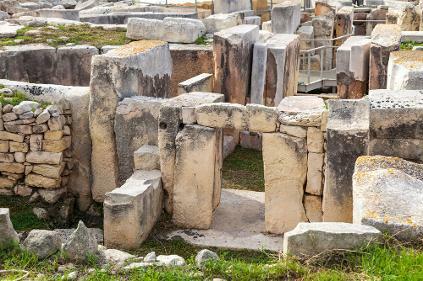 It is considered that two large caverns dissolved out of the limestone, then when sediments were laid down again the weight caused a collapse of the roof. Locality 4: Qwara the 'inland sea'. A cliff encircled inland 'sea' connected to the sea by a natural arch. The cliffs are Lower Coralline Limestone. Locality 5: Dwerja, another solution structure which has been breached by the sea. Lunch. Locality 6: Marsalforn - Globigerina limestone cliffs with the Phosphorite conglomerate bed. Locality 7: Ggantija Temples. Coralline Limestone outer walls, with Globigerina Limestone interior walls. Locality 9: Ir-Ramla bay (time permitting). Upper Coralline Limestone over Greensand and Blue Clay. Day 5. Locality 1: Mosta - Church of St Mary. Locality 2: Mdina - ancient capital city. free to wander around. Visit the Natural History Museum for the Geology exhibit. Other sites: Cathedral, Roman Villa, Battlements with views over Globigerina Plain, St Paul's Catacombs. Locality 3: Dingli Cliffs. Locality 4: Clapham Junction - mysterious cart ruts. Locality 5: Hamrun viaduct. Day 6. A walking day. Locality 1: Ghar Lapsi. Locality 2: Ras Hanzir. The Maghlak Fault. Locality 3: Denbil-Baghal. Eroded inlet with exposures of the fault plane. Locality 4: Nuffiet. Upper Coralline Limeston on the downthrow side of the fault. Locality 5: Ghar ix-Xaghra. Embayment with interesecting faults.Locality 6: Ras il Bajjada. Globigerina limestone exposures.